Ksar Ghilene is as far out into the sandy desert as you can easily go. 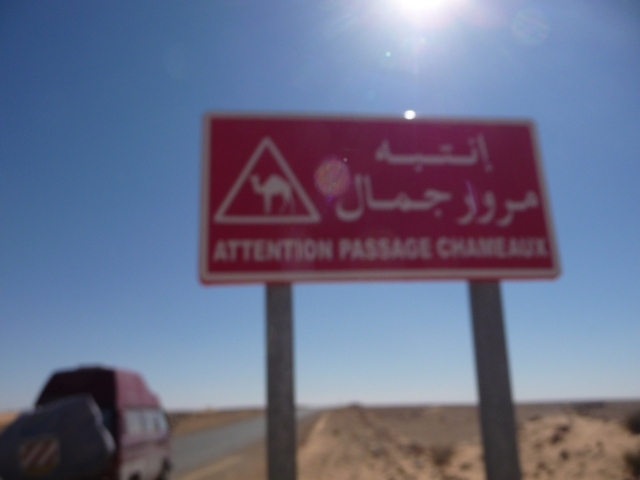 Until very recently, there wasn’t even a tarmac road all the way there – just piste, compressed dirt – but the main route, the “pipeline road” – so called because it follows the route of the oil pipeline heading north from the Algerian and Southern Tunisian oilfields – is now surfaced. As you head down the 75km or so of pipeline road, the landscape gets dustier and sandier, with not very much around apart from the occasional herd of camels in the middle distance. Only one small cafe half-way down the road (renowned, apparently, for the purity of the drinking water from their well) and, in our case, a couple of nomadic types trying to hitch a lift to the cafe to phone for help for their hand-cart, which had decided to shed a wheel. Other than that, the first person you see after turning off the main Matmata-Douz road is the soldier manning the checkpoint, to make sure that those without “serious desert” travel permits turn into Ksar Ghilene itself. The next people you meet are the couple of very friendly villagers who push your van out of the sand when you decide to leave the main track and “just go over that little ridge to look at the view”… If we had managed to peer over that ridge, we’d have seen the barracks. The village didn’t exactly warm the cockles of our heart. It’s a bunch of concrete huts, without any shade or greenery. A couple of them are painted up with 4×4 and trail bike logos, with the inevitable stacks of fuel cans outside. 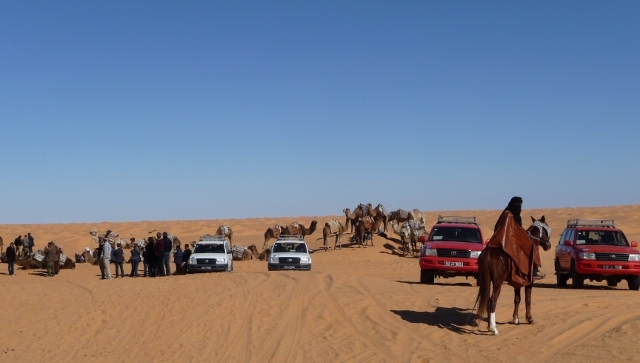 Fortunately, tourists will not see the village other than when they drive between the road and the oasis itself. The oasis is easy to find – it’s the area with the lush green palm trees, probably 200m thick and a couple of km long, surrounded by orangey sand dunes for as far as the eye can see in every direction. We headed in, and experienced the absolute novelty of having to choose a campsite from the several awaiting our business, before exploring the other delights of this vast metropolis. The central feature of downtown Ksar Ghilene is a pool, fed from a warm spring. Around this, there are a ring of cafes, perfectly positioned so that you can sit and watch dusty German bikers splashing around in the pool, as you determine that no cafe has any food available. There was a sign for a Boulangerie – but it was closed. As you approach the pool through the oasis, there are several quadbike rental outfits lining the road. In the other direction, there are several more quadbike rental outfits on the edge of the sand. At nightfall, the campsites fired up their generators – and we had electricity for a few hours. In the morning, we headed into the showers, fed directly from the warm spring. Warm is a relative term. In a nutshell, that is Ksar Ghilene. Actually, that’s not quite true. There’s one other place we didn’t mention – the Ranch Nomade. They rent quads of a different kind. It was too good to resist, really. Several kilometres out into the sand, almost visible on the skyline, there’s a Roman fort – one of a chain which protected the southern edge of the empire. We could have walked there, I s’pose. 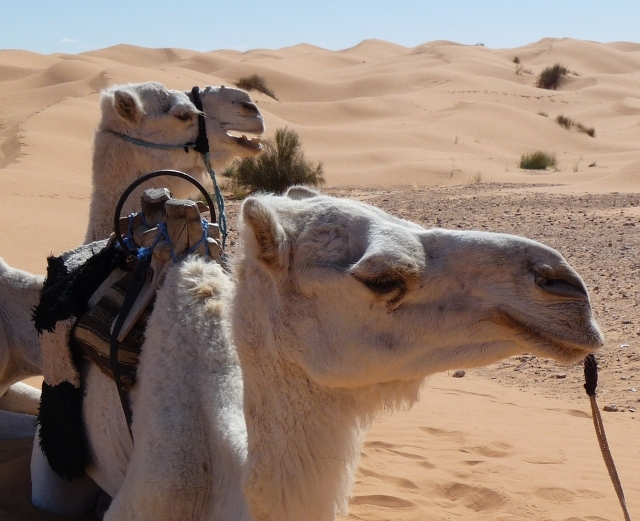 Our steeds for the trip were a pair of white camels – Méhari – the fastest of the various breeds, used for racing. Ours didn’t seem particularly keen on racing, preferring a mild amble, stopping to chew at the odd bit of protruding greenery as our guide led them up and down the dunes, whilst the odd complaining noise issued from both ends. Perched on a rug-covered wooden saddle just aft of the hump (racing jockeys apparently sit in front), this was about as good a situation as we could hope for. At one point my camel’s lead came untied from Ellie’s, in front. A brief moment of panic as I pictured the beast bolting quickly passed, as it just came to a stop and looked around… Mine was friendlier than Ellie’s, occasionally catching up with her for a quick nuzzle, rewarded by a stroke of his fluffy head. Every time hers was approached, though, it gave an evil glare and a gargling snort. 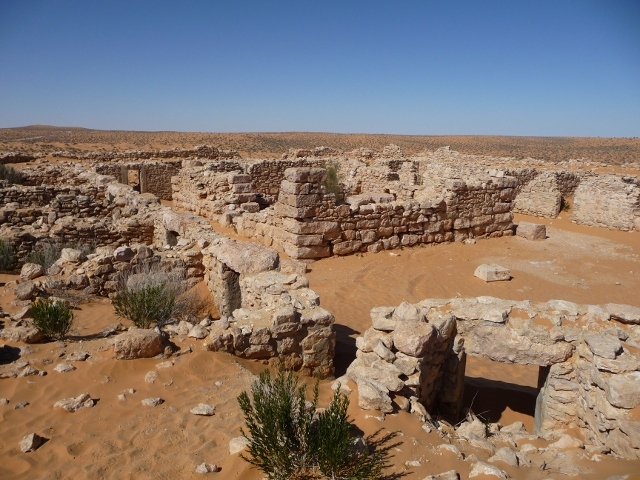 The fort itself isn’t huge – a series of small rooms inside the outer wall, around a square guardroom – but it does remain in decent condition, despite the best efforts of the sands to reclaim it. As well as our trek out to the fort, the Ranch offers short “tasters”, popular with the day-trip-from-Djerba crowd whose liveried 4x4s filled the oasis up for a couple of hours in the middle of the day. If you fancied more, you could take an overnight trip out into the dunes or even a week long trip to Tatouine, Matmata or Douz. I think our choice was about right – an hour or so either way was just about enough to leave us only spending the rest of the day walking like an Arabic John Wayne – and, to be honest, a bit of the romance of an overnight camel-camp in the Sahara would be lost through the bog-standard modern tents we saw strapped to saddles, rather than evocative carpetted nomadic tents. 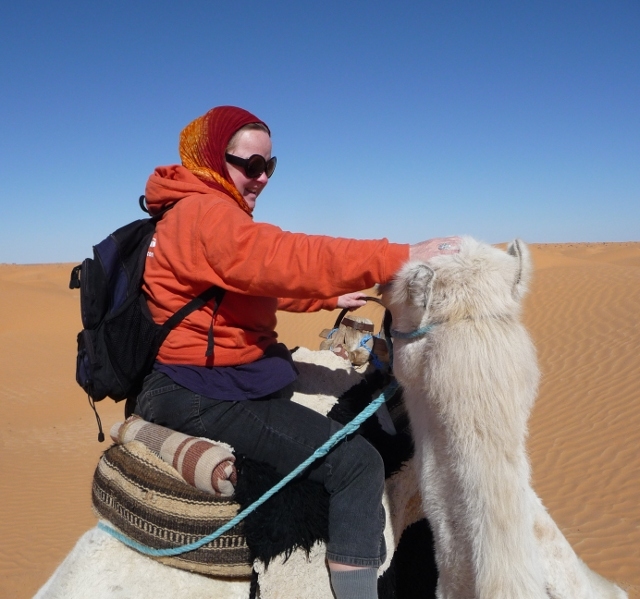 I can see the logic, sure, especially with the February nights getting down to almost freezing – but who goes camel trekking for logic? The sand itself is the reason people go to Ksar Ghilene, of course, and it did not disappoint. The dunes are not high, maybe only a couple of metres at most, but they are truly magnificent. They curve and dip like the waves of a choppy sea. When the breeze gets up, the air around their leeward sides becomes gently blurred, and all footprints quickly become obliterated. When you walk across them and disturb an edge, the extremely fine sand slumps downwards gently, like slow-motion water. Without modern navigation equipment, clues or landmarks to get bearings, it would be almost impossible not to become disorientated almost immediately – yet to the people who live here, it’s been second nature for centuries to navigate across vast distances. 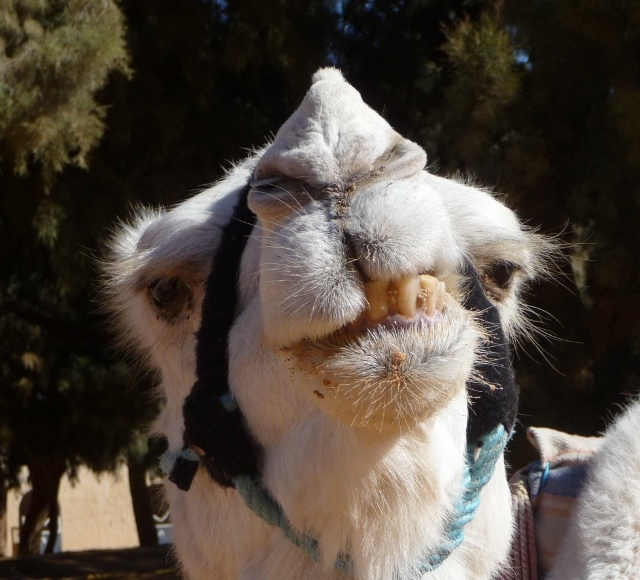 This entry was posted in By Country - Tunisia, Travel stuff, Uncategorized, Wildlife stuff. Bookmark the permalink. Well, you have truly driven a Mehari across the desert. (But not as the Citroenistes would have expected!) Enjoying the reports. At 8am on a grey morninig, looking at your photos of the camels , desert and sun, I am still enjoying the blogs from you both and learning a lot.